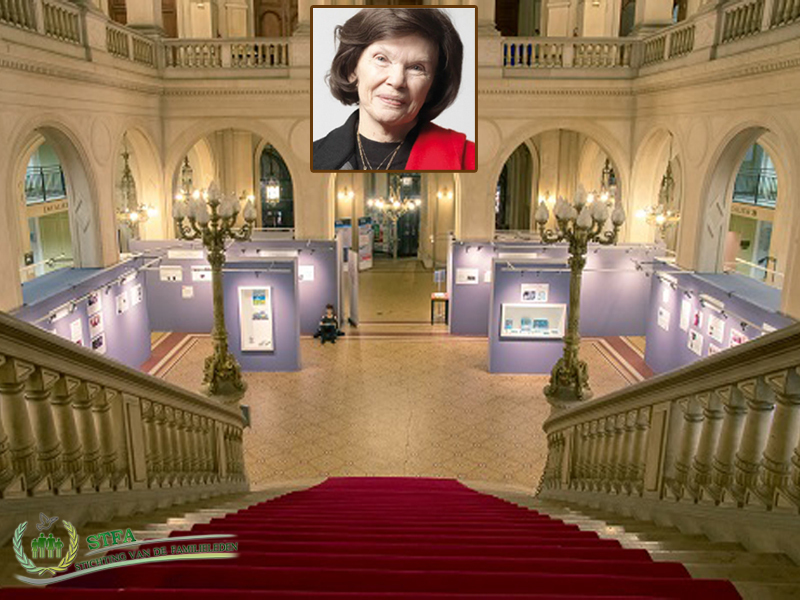 For the close relationship between our STFA and the "Danielle Mitterrand" Foundation, I would like to mention the third anniversary of the death of Danielle Mitterrand on 22 November 2014 in the World Hotel Bel Air at The Hague in presence of her son Gilbert Mitterrand, now President of the Foundation, and her grandson. France Liberté founded in 1986 by Danielle Mitterrand, is a recognized charitable non-profit foundation which is committed to the defense of human rights, common heritage and the fundamental right to have acces to fresh water for everyone. The foundation strives to contribute to the establishing of a more cooperative world and stands up for the oppressed peoples, the minorities not being represented by recognized states and for those who have no voice on the global platform. • Support for alternative environmental measures that are in harmony with the nature and that are based on the principles of "Living Well". • Support and protection of oppressed peoples and minorities including their knowledge as guardians of the biodiversity and the common heritage of humanity. • Translating the universal message of these peoples to the modern world to inspire them and to address a human interpretation to their development. In the past "France Liberté" stood up for the rights of ethnic minorities (Chechen, Kurd, Touareg, Quechua, Rom, Karen, Tibetan, Maya, Pod, Mapuche Sahraoui ...), livingh under authoritarian regimes. For them the defense of their right to self-determination has high priority. France Liberté is also working hard to protect their culture and their history, their economic development and their right to have access to their own natural resources. Thanks to its consultative status at the UN Human Rights Council, "France Liberté" shares its platform with peoples to denounce states that do not recog-nize their political, civil, social and cultural rights. In addition they support projects in the field for the oppressed people (the reconstruction of the education system in Cambodia, medical aid to Burmese refugees in Bang-ladesh, health centers in Nepal, humanitarian aid to Iraqi Kurdistan ...). Today, in a world that is constantly changing because of the outbreak of serious socio-ecological conflicts, "France Liberté" gives priority to the rights of indigenous peoples to dispose of their natural resources, opposite a dominant system that deprives or destroys their natural resources, culture and tradi-tional lifestyle. The participants of the event were welcomed by Remi Feraud, mayor of the 10th arrondissement of Paris. The quasi comedy theater company "La Tribouille" started the opening scene of the evening with the slogan "For the time being we don´t change anything, we will see " exactly the opposite of the spirit of resistance of Danielle Mitterrand: namely resistance to everything what is shocking, outraging and embarrassing her. Gilbert Mitterrand, President of "France Liberté", began his speech by highlighting the original idea of the Foundation: "giving a voice to those who do not have one". In the last 30 years the opposition started to focus on human rights which are inextricably linked with the defense of the essential values of life. He pointed out that Danielle Mitterrand being back from the World Forum in Porto Alegre in 2002, the preservation of the diversity of life, that is essential for the preservation of life, has added to the themes of common sources and the defense of fundamental human rights. He indicated that we have our future in our own hands, recalling that we, like Danielle Mitterrand, should say NO and must dispute everything even when we are criticized for being too radical". However as she underlined herself "in order to get done the minimum, we must be very radical". He referred to the website for information on a wide range of actions that are supported by the Foundation in the interest of the resistance. So realism can be linked to idealism by transferring the struggle for water in France into resistance in cutting off springs. In conclusion Gilbert Mitterrand reminded the attendees to the Iranian resistance and spoke full of praise about the resistance against the dictatorship and encouraged them to continue the opposition also in the name of Danielle Mitterrand. After Gilbert Mitterrand´s speech the "Danielle Mitterrand" prices 2017 were awarded by Michèle Rivasi, member of the Board of "France Liberté". Since 2013 the "Danielle Mitterrand" prizes were awarded for various initiatives in opposing biopiracy* and for granting of asylum (to citizens of Lampedusa). The Indian environmental-activist, writer and science philosopher Vandana Shiva was awarded the "Danielle Mitterrand" prize – an alternative Nobel Prize for personalities. Under her inspiring leadership a new generation of activists is campaigning in order to achieve a fairer and more cooperative world. Vandana Shiva is fighting many years against biopiracy* by supporting the traditional biological farming, by respecting seed to be found free in the nature and by the free provision of seed. "Life is not an invention", seed is not the property of a chemical company proclaims the Indian scientist, addressing Monsantos (the biggest seed corporation in the USA) and other multinationals. "All patents on biodiversity, indigenous knowledge and resources that are based on biopiracy need to be banned including all patents on life and living organisms". *Biopiracy describes a practice in which indigenous knowledge of nature is used by others for profit, without permission from and with little or no compensation or recognition to the indigenous people themselves. Indigenous knowledge of medicinal plants is often patented by medical companies that are not willing to recognize the fact that the knowledge is not invented by the patenter, and that they are depriving the indigenous community to the rights to commercial exploitation of the technology that they themselves had developed. The "Danielle Mitterrand" price was handed over to "Alternatiba", a collective initiative that numerous alternatives generates for a righteous and fairer world. The purpose of the in origin Basque movement "Alternatiba" shows that there are solutions in the fight against climate change. By public awareness "Alternatiba" shows that everyone on his or her level can change things in a concrete way and can mobilize forces through promoting to taking the right decisions both locally and globally. The right to self-determination of all peoples over their own natural resource. The opposition on all levels: education, environment even sexual discrimination, it is therefore important to join all forces against what is happening in the other camp. The encouragement to decipher information and the dissemination of knowledge in order to increase the general awareness. Defending the right to acces to fresh water for everyone through actions in France against the cutting off of water resources "Give the water back to the earth for the recovery of the climate". International solidarity with the condemnation of the fascist regime in Iran. "Danielle Mitterrand is present in the hearts of all loving and democratic people. She is the mother of the Kurds and the Iranians". Standing up for the reception of refugees : "like from 1991 many Kurdish children are received, the reception of refugees is not in question today: SOS Méditerranée (a civil, European Organization for the rescue of refugees in the Mediterranean Sea) takes daily between the 100 à 200 boat refugees on board of her Aquarius". The fight for human rights, for the right to dispose over fresh water springs, fight against exploitation, discrimination …., a fight that has been waged for 30 years by "France Liberté", wasn´t only expressed this night through speeches and theater acts but also through an exhibition of photographs and drawings that were selected for the award of the jury and public prizes. We were allowed to visit the exhibition after Maryam Rajavi who was individually shown round the majestic lobby with the drawings. After the awards we were invited to visit the exhibition and to taste the snacks and drinks according to exotic recepts that were exposed on a large buffet. Foreign chefs had dishes prepared to let us enjoy specialities from Syria, Iran, Chechnya, Sri Lanka, India, Ethiopia or Afghanistan. Unfortunately my three traveling companions could not participate in these festivities because they had to leave before the end of the event to return to the Netherlands. I was not fond of a round trip to Paris in one day so I stayed there and I have still do not regret.